Are you experiencing problems with the water lines or sewer lines that run to and from your home or business, but dread the mess and expense of digging up your property to provide access for repairs? Budget Drainage has the solution! We now offer repairs and replacements of underground pipes. We use the latest trenchless technology for a water line or sewer line replacement in North Vancouver and the surrounding communities. There won’t be heavy machinery running over your landscape, driveway, or paved surfaces. And, any access holes that are made can be easily restored. For homeowners in North Vancouver, trenchless pipe replacement is truly the way to go. Quite simply, trenchless pipe repair is a method of accessing underground water lines and sewer lines without the need for extensive excavation. Work is performed underground from an entry and exit hole, utilizing existing pipework, with specialized equipment. Our trenchless line repair services begin with a video drain inspection that allows us to remotely view the condition of the line in question, identify the exact location of the problem, and determine whether or not trenchless replacement is possible. We dig access holes at either end of the damaged pipe to allow the entry and exit of the new pipe. Using the access holes, we run new pipe through the existing area that contained the old, damaged line. Once the job is finished we will once again perform a video inspection to ensure that there are no problems with the new line. 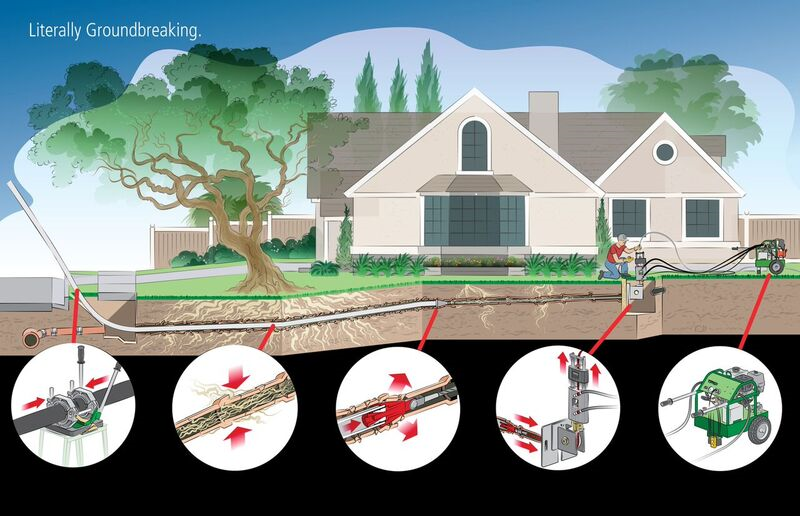 For more information on the process of trenchless technology, check out our guide. There was a time, not so long ago, that a repair or replacing a broken or malfunctioning sewer or water line required excavation. Often this excavation would be done using heavy equipment, but in areas of limited access it would have to be done by hand, using shovels and other equipment. Trenchless water or sewer line replacement minimizes the need for digging, allowing your sidewalks and landscaping features to remain undisturbed and intact. For more information how how trenchless pipe services are better for you and your property, please read our guide comparing trenchless to traditional. Budget Drainage specializes in trenchless, pull-through line repair and replacement in North Vancouver, West Vancouver and surrounding communities. We are the Greater Vancouver Area’s premier source for drainage solutions, and customer satisfaction is our top priority. For more information about our trenchless services or to schedule a no-obligation consultation at your location, please contact us at 778-231-6960.